February 23, 1958 Fidel Castro commission its brother, the Captain Raúl Castro, to choose 50 men of the troop and to go to the Sierra Cristal to open the Second Front "Frank Pais". March 1 Raúl went with 67 men to their zone of operations, arriving March 11 with 77 men, therefore various men united them. The troop needed constant provision of munitions and weapons, many of which were bought in other countries. The control of the sea by the Cuban Navy and the urgency, do that the best way of transportation be the air one. The first airplane was expected that landed in Moa, and the rebels of Raúl took its airport March 31, but for lack of coordination, they retire, therefore the airplane arrived at the zone of Fidel March 30. That was a Curtiss C-46 Commando number TI-1019C of Costa Rica, rented by $2,000 in Miami, United States, to a gentleman surnamed Guerra. 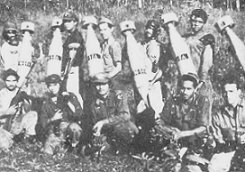 The C-46 transported weapons delivered by the old Leader of the Army of Costa Rica, with the support of the president José Figueres, that asked that the operation was discrete to not have problems with Batista. The arms were 38 rifles Mauser, 10 Beretta, several machine guns M3, two of Cal.50, 10 machine guns Rainser, and munition.The pilot of the airplane was Pedro Luis Díaz Lanz, future leader of the FAR after the triumph. The airplane was damaged during the landing in Cienaguilla. 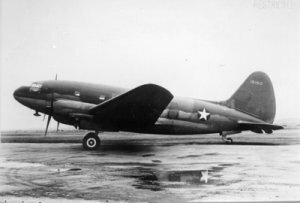 The C-46, after dischargeed, was set on fire and abandoned, to avoid that to be identified. But the Army arrived at the place days later and identified the airplane and its origins. November 30, 1958 Raúl appoints Chieff of Supply of the FAR to Ramón Castro, older brother of Raúl and Fidel, that shows the importance given to the aviation. An runway is prepared in the farm "La Esmeralda", by Sagua de Tánamo, to receive for the first airplane, a Cessna-195 bought June 19, 1958 by del Río in Miami by $5,500. But June 20 in the afternoon 2 F-47 Thunderbolt discover the runway. To the dawn of the following day, the rebels expect to the Cessna, but the airplane that appears was a C-47 of the FAEC (N° 210) in recognition, and immediately a F-47 (N° 456) overfly the the field, diving and throwing 2 bombs of 500 pounds. Then arrive a B-26 (N° 903), piloted by Roberto Pérez Montiel (graduate in 1955), that throws 6 bombs of 100 pounds, both aircrafts shoot more than 1,000 munition during 45 minutes. .At 10 o'clock of the morning the FAEC airplanes arrive again, with the F-47 N° 464, the B-26 N° 913 and 931, and the Beaver N° 18, they bombing using napalm the infrastructures. Raúl Castro themselves coming to the place, and the Beaver shoot their jeep, that was hit. The runway remained damaged. The rebel Cessna-195 take off at night from Miami, but the motor stopped it and was crashed by San Germán. The crews Orestes del Río and Guillermo Verdaguer, left unharmed. June 28 Raúl ascends del Río to Captain. August 30 a Beechcraft D-18 with weapons is sent to the Che Guevara and lands at 20.25 o'clock hours at night by Cayo Espino. The Army detects it, and calls to the FAEC, her airplanes appear to the 25 minutes, bombing and leaving useless the rebels airplane. Che Guevara relates it: "We Were going to begin the march in trucks, August 30, 1958, when a fortuitous accident interrupted our plans: that night arrived a small truck with the uniforms and the necessary gasoline for the vehicles that already were prepared when also arrived for air way a weapons load to a nearby to the Road airport. The airplane was located at the moment of landing, in spite of being during the night, and the airport systematically was bombing since the twenty until the five of the morning, then we burn the airplane to avoid that he fall in enemy hands or to avoid the diurnal bombing, with more worse results. The enemy troops advanced to the airport; they intercepted the small truck with the gasoline, leaving us on foot. That we begin the march on August 31, without trucks neither horses, expecting to find them after crossing the highway of Manzanillo to Bayamo"
This it was a project begined by the rebel Lieutenant Evans Rosales, second leader of the FA and Chief of the shop. 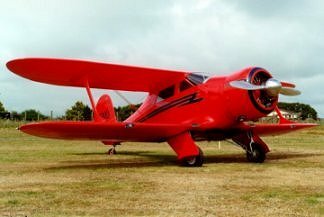 He used parts of the fuselage and motor of a retired Piper PA-12. On November 14 Evans achieves to extract of the two DC-3 destroyed in Mayarí Arriba parts and other mechanisms for its project. However, the technical and material lack impedes that be carry out this project. Likewise the factory of Evans begin the construction of 100 pounds bombs for the FAR, and of grenades and mines for the rebel troop. The main source of materials were the non exploited bombs of the FAEC and they should be utilized against their old owners. The first real military airplane able in rebels hands coincidentally was captured for the FAR November 10, when landing in rebel territory a Vought Sikorsky OS2U-3 Kingfisher FAN N° 50 of the naval aviation, that had problems with the motor and was piloted by the Lieutenant Antonio E. Bascaró Sánchez. In the official report of the FAR told that the Kingfisher was "intercepted" and captured, to do to the Army believe that the FAR has fighters. 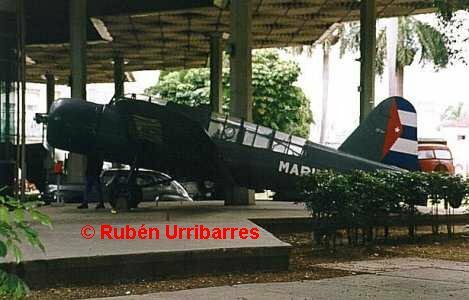 December 4 at 17.45 o'clock arrives a North American T-28 Trojan to Mayarí Arriba directly from Miami, piloted by Jorge Triana. The airplane arrived in perfect conditions and with Jorge came a doctor. The following military airplanes are the two North American F-51 Mustang described in the next chapter, and that arrived at the war´s end. As curiosity, is able to say that the motor of the Kingfisher really had serious problems and could not be repaired with the scarce rebel resources. Therefore the airplane was repaired adapting him the motor of the Beech D-17S (that crashed the September 29 when landing), this work was made in campaign conditions and with total success.